Never thought I’d be channeling my inner JFK, but here goes. My reasoning for doing a solo “ugly” ride today, a ride I really don’t look forward to but do on those days where I feel beat, spent, the rear view mirror showing a week behind me that I’d not want to repeat. One of those days it would be so easy to rationalize taking the day off. That rarest of days where you’re thinking, this is not a day I’m going to feel better after then ride than before. When I find myself thinking stuff like that, it’s time for The Ugly Ride. No Pescadero cruise with a reward at the Bakery. No climb that I’ve done zillions of times before and could do blindfolded with one leg in a cast. Time to do something just to prove I can. So here goes my personalized version of JFK’s famous Rice University “Moon Speech” (from September 12, 1962). I choose to climb Redwood Gulch. I choose to climb Redwood Gulch, when I’ve had the toughest of weeks, not because it is easy, but because it is hard, because that goal will serve to organize and measure the best of my energies and will, because that challenge is one that I am willing to accept, one I am unwilling to postpone, and one which I intend to win, and the others, too. Kevin was off on a date with his girlfriend so it was a solo ride today. And yes, it was an exceptionally-challenging week at work, and some of that challenge followed me home. Plus the whole Supreme Court thing, where we can’t really know what happened but we do know that our newest member of the Supreme Court said at the hearing that he was drinking legally because the legal age was lower then, except… that it wasn’t. At the time of Kavanaugh’s self-described heavy teenage drinking, he not only knew what he was doing was illegal, he also had to rationalize why it was OK. That rationalization, to me, is the important part. Does he still rationalize things the same way, or did he have a come-to-Jesus moment and suddenly become an adult? We don’t know because he lied about the circumstances. And because nobody on the panel thought to ask about it. So the un-knowable remains (a lack of corroborating witnesses to provide validation to Ford’s story) but what was known, or became known, wasn’t explored. OK, that’s as far as we’ll go for the politics right now. Back to the ride. I couldn’t help but take the small detour into the shopping center where our Los Altos location used to be… still empty. It’s hard not to think about the opportunity the landlord passed up when we discussed a bit smaller space for less rent. If I was riding with Kevin we’d stop at the Peet’s for coffee, but the point to today’s ride wasn’t about having fun; it was about perseverance and part of keeping things “Ugly” was skipping little pleasures. It was inevitable, obviously, that despite how slowly I approached Redwood Gulch, I couldn’t help pushing hard, and ended up with a respectable time. Once on Highway 9, totally different story! If you didn’t know a sloth could ride a bike, I’m here to tell you it can be done. And once on the top, the worst of all possible worlds. No Mr. Mustard, and heavy smoke from a fire somewhere! This “Ugly” ride was living up to its promise! 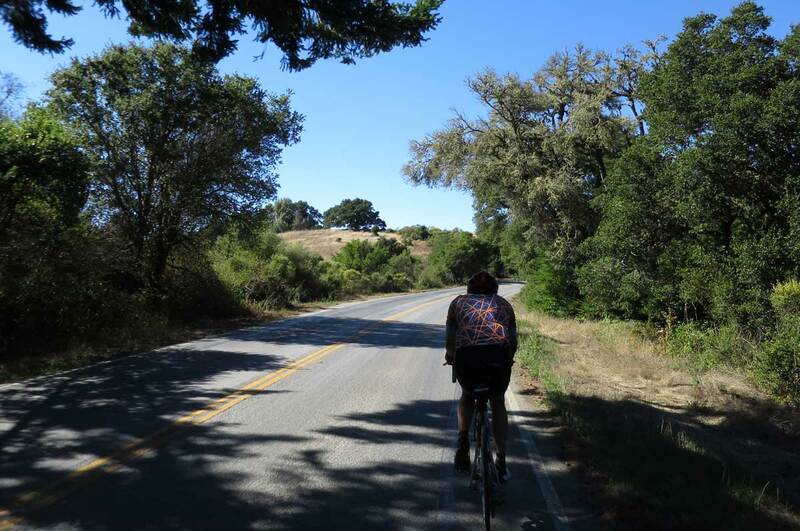 But from that point on, the ride got better and better, as I felt increasingly human, especially when faced with a rabbit (another cyclist) to chase on Skyline. Not a very talkative guy, but at least he’d respond when I’d warn there was a car back. And yes, by the time I got home, I was really glad I’d ridden. Especially when I got on the scale and saw a number I hadn’t seen for a while.